Journalist, Writer and Filmmaker John Pilger [image left] granted this exclusive interview where he talks about the US war on democracy in Latin America. “Modern era imperialism is a war on democracy. Genuine democracy is a threat to unfettered power and cannot be tolerated”, he says. Pilger evaluates the mainstream media coverage regarding to Venezuela: through accurate data, he evidences how people around the world have been misinformed by the media propaganda. The prominent filmmaker ends this interview with not very positive forecasts for the country that has the largest oil reserve in the world, Venezuela, and for the richest region in terms of biodiversity in the world, exactly Latin America. “This is a dangerous time in Latin America. (…) The United States wants their ‘farm’ back,” says John Pilger among other important observations. He also out his new production to be published in the near future, The Coming War between America and China. Edu Montesanti: Thank you, John, for granting me this interview; I am so very honored by it. Would you comment please your new documentary The Coming War between America and China, to be published? What will it bring to us, what motivates you and what’s your aim? John Pilger: The new film describes a dangerous and unnecessary cold war between the United States and China: the same cold war that’s directed at Russia. It examines President Obama’s ‘Pivot to Asia’ – the shift of two thirds of American naval power to the Asia-Pacific by 2020 as a military response to the economic rise of China. The film is set on island ‘frontlines’ in the Pacific and Asia: the Marshall Islands, where the US tested its nuclear bombs during the 1940 and 50s and now maintains a ‘Star Wars’ base; Okinawa where the US has 32 military installations less than 400 miles from China; Jeju Island (Korea), where a recently completed naval base allows the US to aim its Aegis missiles at China; and Shanghai, where I have interviewed a range of people about China’s rise; they are voices seldom heard in the West. Like all my films, the aim is to push back the facade of propaganda that covers so many critical issues, especially those of war and peace. Edu Montesanti: What motivated you to produce your 2006 film, set in Latin America, The War on Democracy? John Pilger: Modern era imperialism is a war on democracy. Genuine democracy is a threat to unfettered power and cannot be tolerated. Most of the governments the US has overthrown or attempted to overthrow since the end of World War two have been democracies; and Latin America has been its theme park of corrupt power and imposing its will. One US ‘success’ was the destruction of the Arbenz government in Guatemala in 1954. Jacobo Arbenz was a democrat and modest reformer who didn’t believe the United Front Company should run his country and reduce the lives of his people to peonage. To Washington he represented what later said of Nicaragua under the sandinistas; democracy in Guatemala was ‘the threat of a good example’. This was intolerable to the US, and Arbenz was overthrown, personally humiliated and expelled from his own country. That set the pattern for the entire continent. Edu Montesanti: Would you comment your idea, John, on Venezuela when you left the country after producing your film? What most drew your attention, and what has changed (if anything has changed) in your ideas about the caribbean country, and the Bolivarian Revolution itself? John Pilger: My impression was that Venezuela was undergoing imaginative, historic, even epic changes. In the barrios, local democracy in the form of autonomous communal councils was changing people’s lives. Children were learning about history and the arts for the first time; Venezuela’s literacy programme was the most adventurous in the world. The rate of poverty halved. What struck me was the pride ordinary people felt – pride in their revitalised lives, and in the previously unheard of possibilities that lay ahead and in their government, especially Hugo Chavez. It was also clear that Venezuela was not revolutionary; it was and still is a social democracy. This is not to say that many of the chavista ideas were not revolutionary in spirit; but in practice Venezuela bore similarities to Britain under the reforming Attlee Labour government of 1945-51. The wealthy and so-called middle classes, those who live extremely well in East Caracas and look to Miami as a kind of spiritual home, retained economic power if not political power. So two Venezuelas existed side by side; in revolutionary terms, this was and remains untenable. Edu Montesanti: You interviewed former Presidente Hugo Chávez for hours, John. Taking into account and what you saw in the country, what can you say about Hugo Chávez, as a president and as a human being? John Pilger: I traveled with Hugo Chavez across Venezuela. I have never known a national leader so respected and held in such affection as Chavez. He was an extraordinary man, who never seemed to sleep, who was consumed by ideas. He would arrived at a farmers’ meeting with a stack of books under his arm: Dickens, Orwell, Chomsky, Zola. He had marked passages to read to his audience and people listened intently; he saw himself as the people’s educator. He was also, incorruptible and tough – tough in the sense that he was brave. He was also mischievous. Once, I feel asleep in the sun during one of his long outdoor meetings, I awoke to hear y name being called out, and people laughing. To ease my embarrassment, ‘El Presidente’ presented me with a local wine. “He is Australian; he likes red wine,” Chávez told the crowd. I should say I almost never speak of politicians in this way. His flaw was that essential power flowed down from him; he was Venezuela’s caudillo and idealist-in-chief; and when he died, the gap was too great. Edu Montesanti: What similarities do you see between the economic warfare perpetrated by the US against Salvador Allende in Chile in the early 1970’s, and against the Bolivarian Revolution in Venezuela today? How much do you think this secret warfare by Washington, besides the information warfare, has influenced the opposition’s victory in the Parliamentary election in Venezuela, in December, 2015? John Pilger: There is an enduring dynamic third force in Latin American countries that tries to control events and destroy social justice — that’s the United States. US subversion, whether direct or via a proxy in countries that have elected reformist governments the US fosters a permanently aggrieved opposition. When you think of the indoctrination of North Americans who are told their country is a paragon of ideals, the irony is hideous. This ‘warfare’, as you describe, has been significant in every Venezuela election – but it wasn’t the major factor in the 2015 Parliamentary elections; and it can’t be compared with the US campaign against Allende. Inflation, shortages and political fatigue were crucial elements, not to mention the grievous absence of Chávez. Edu Montesanti: Commet please the mainstream media coverage of Venezuela, since Hugo Chávez won the presidential election in 1998. John Pilger: The University of the West of England ran a study over ten years on the BBC’s reporting of Venezuela. The researchers looked at 304 BBC reports broadcast or published between 1998 and 2008 and found that only three mentioned any of the positive policies introduced by the Chavez government. The Guardian’s reporter made no secret of his animosity towards Chavez. The same was true of many of the US and European correspondents. Has there been such a relentless display of bad faith journalism? I doubt it. As a result, people in the US and the UK and elsewhere were denied any real sense of the remarkable changes in Venezuela. Edu Montesanti: In the end of your documentary The War on Democracy, you said that “what happened in the National Stadium in Santiago, Chile, has a special place in the struggle for freedom and democracy throughout Latin America and the world. The vowel is ‘never again’”. Countries in Latin America with progressive governments have lived under the constant threat of the “color revolution”, a non-violent method to overthrow governments perfected by the American Gene Sharp, a North-American professor of Political Science. Given also the opposition pro-US victory in recent elections in Venezuela, Argentina and in a referendum in Bolivia, do you fear a new dominance of US interests in the region? What is your prospect for Latin America, and what does the Bolivarian Revolution mean for the region? 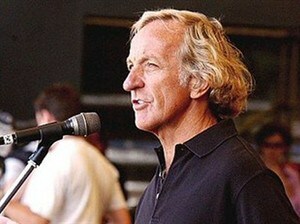 John Pilger: This is a dangerous time in Latin America. The gains made by the social democracies are more precarious than ever. The US used to refer to Latin America as its “farm”, having never accepted the independence of Venezuela, Bolivia, Ecuador and, of course, Cuba. The US wants its “farm” back. There is much to lose. I read the other day that, according to the Bolivian Ministry of Health, 85,000 lives had been saved in Bolivia by Cuban doctors. It’s an achievement on that scale that is at risk now. They need our voices and support as never before. The original version of this interview was published here in Portuguese. Edu Montesanti is author of Lies and Crimes of “War on Terror” (Brazil, 2012; Mentiras e Crimes da “Guerra ao Terror”, original), writes for Truth Out, for Pravda Brazil and Pravda Report (Russia), and for Diário Liberdade (Galiza). He was a translator for the Afghan writer and activist for human rights, Malalaï Joya’s and to the Argentine NGO Abuelas de Plaza de Mayo‘s website, and was a columnist of Observatório da Imprensa (Brazil).